Milk and Eggs: Fresh & Fit! You're invited to Milk and Eggs Food Art Installations on Sunday, January 14th, 2018! Start your new year off with a whole new way to experience your favorite products at Milk and Eggs! Enjoy craft cocktails, art exhibitions & installations, and your favorite Los Angeles chefs & Milk and Eggs vendors! 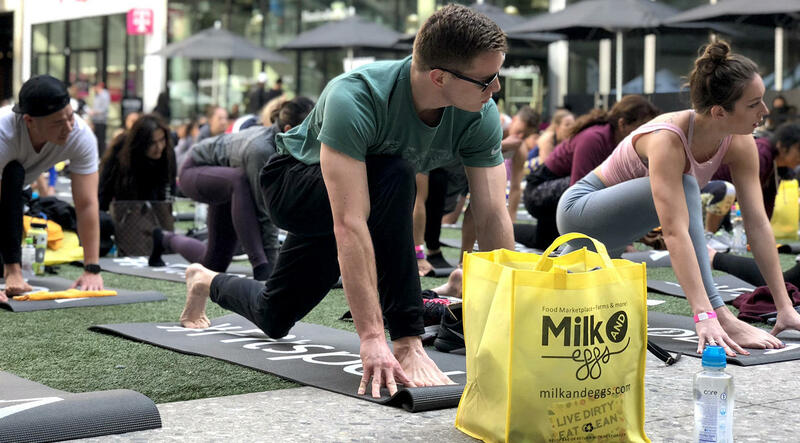 You're invited to Milk and Eggs Fresh & Fit event on Sunday, August 26th, 2018! A FREE fitness and health event designed to inspire, educate and motivate! Limit ONE (1) Fitness Class RSVP per person. Check out some of the vendors that will be at our event! RSVP to any class of your choice with the button at the top! Limit 1 class RSVP per person. First come, first serve. Max 35 people for Outside Yard classes. Max 16 people for Gym Room classes.